Tsunatoshi’s (綱俊) family name was Kato (加藤) and he was born around 1800. He was the son of Dewa (no) Kuni Kunihide (国英) and he was the younger brother of Kato Tsunahide (加藤綱英). The Kato (加藤) family smiths were originally from Yonezawa in Dewa. Tsunatoshi (綱俊) was called Kato Hachiro. He has dated works from around 1823 that he made at Azabu, Edo where he did most of his work. He received the title of Chounsai (長運齋) in Ansei Gannen (1854). He handed down this title to his son, Koretoshi (是俊), in 1856 and took the new title of Chojusai (長運齋) for himself. It is said that he received a stipend from the Uesugi Clan. He died at the age of 66 on the fifth day of December 1863. (加藤綱英). Either way, the closeness of their working styles shows that they were related in some way. Among Tsunatoshi’s (綱俊) other students were Takahashi Naganobu (高橋長信), Ishido Korekazu (石堂是一), Seiryuken Moritoshi (盛俊), and others. 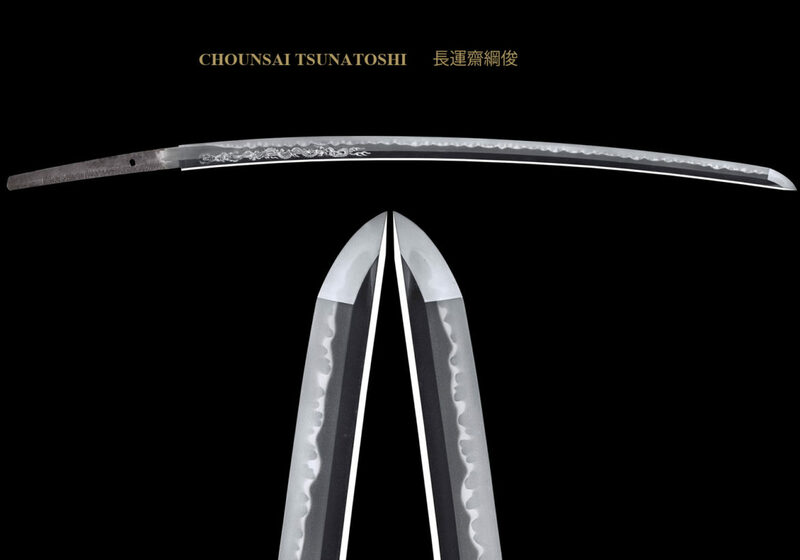 There is no doubt that Chounsai Tsunatoshi (長運齋綱俊) was one of the leading sword smiths of the Shinshintô Period. While Tsunatoshi (綱俊) did toran-midare like his older brother, Tsunahide (綱英) was famous for; he really excelled when he worked in the Bizen tradition. The sori will be deep koshi-zori and the kasane will be thick. His usual hamon is ko-choji midare or ko-midare. The hamon will consist of a tight nioi guchi and hard, dark spots can be seen in the yakigashira (upper part of the yakiba). There will be an uneven pattern of nie covering the nioi guchi. They will be ara-nie in areas. The hada is a dense ko-itame hada mixed with o-hada in some areas. It is so tight that it will almost appear as a muji-hada. This is an important kantei point that separates Tsunatoshi (綱俊) from Koyama Munetsugu (固山宗次). Munetsugu’s (宗次) hada is a fine kitae of ko-itame that has a flowing feeling and a beautiful visible pattern. 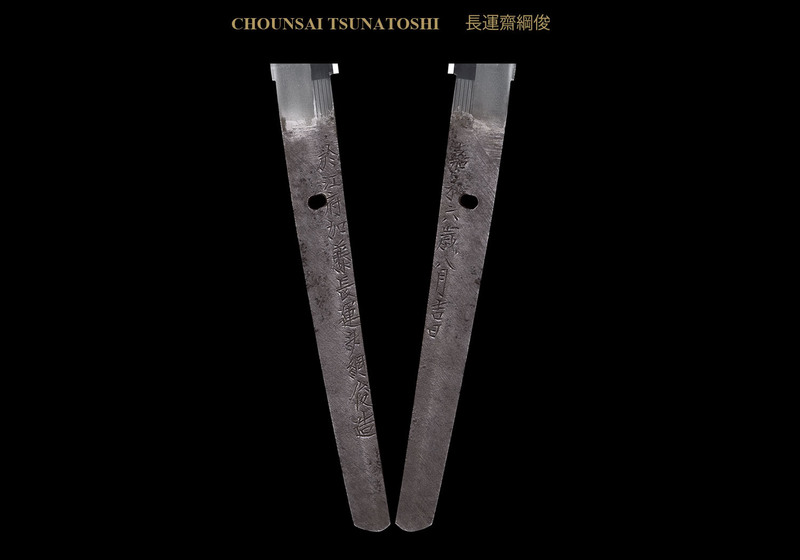 Tsunatoshi’s (綱俊) bôshi is usually done midare-komi. The nakago is made with the tip in ha-agari-kengyo. The yasurimei are sujikai with some kesho at the top.